I've decided I'm not going to start a series of reviews like I said last time. I'm more than comfortable writing articles that, according to what I feel like writing, stand alone. I'm a few hours into Halo: Combat Evolved for the PC, and so far I really don't have any complaints (see previous post). There were several ways for this dreaded review to go down. Okay, it wasn't dreaded; I was actually pretty excited as you don't really get to do "investigative" things so often. I could have been completely blown away and therefore required to take back every nasty thing I said about Halo. I could have found that it was a totally mediocre game as I suspected, and therefore justified in my complaints. Or, as I had hoped it wouldn't turn out, the game could be "okay" and therefore give me very little to report. So, after all of the lamentation of the loss of gaming culture to the "bros" that I've done, how does Halo finally stack up? I like it. Take a second to pick your jaw up and strap in, because I have some pretty interesting things to say about it. Ah-Break-to-the-DOWN! Overview + FYIs: I have said before that I tried the demo several times. Said demo never motivated me to purchase the full product, and if this experiment hadn't come along I never would have known that the full product is better. I am not including multiplayer, something that people would call unfair, but honestly while most people say that multiplayer is the reason to play Halo, I honestly had more fun with singleplayer anyway. To include multiplayer would bring my rating that I'm not going to give it down. I am not done with it yet, but I'm enough into it to be able to give some impressions. This is part 1. Also, while the general response is that I "liked" this game, that it has even exceeded any expectations I had, it does not mean that I consider it on par with any of my favorite games. At this point, Halo has only proven itself as a decent and even compelling game, but even so it is not a series I could become enthusiastically involved with. To me, while it is a decent game, the relative fan response it has received is still largely unjustified. I mentioned before that there was some concern over my ability to be "fair" to it considering it came out while I was in high school. This, I found luckily was not a concern. The graphics are "fine" and are not aged to the point of looking "bad" to me. The bump-mapping effects on things like floors are actually a little better than what was originally shipped with Half-Life 2. They're almost as good as the effects in the antlion cave in HL2: Epidode 2. My gaming hardware is beyond any requirement for the game, and I can therefore enjoy it "as intended", in full 60 fps buttery-ness, which is not always the case with new games. This is, however, negated (as was the case with BioShock) by the fact that it was ported from XBOX. The game probably ran at ~30 fps on the XBOX, which probably caused the developer to not bother with 60fps animations, so whenever I reload or do anything, the game runs at 60fps but all of the animations seem slow. The design is fantastic, and I was glad to see that except for the cliche of space marines, all of the alien architecture and organisms are of very creative design. 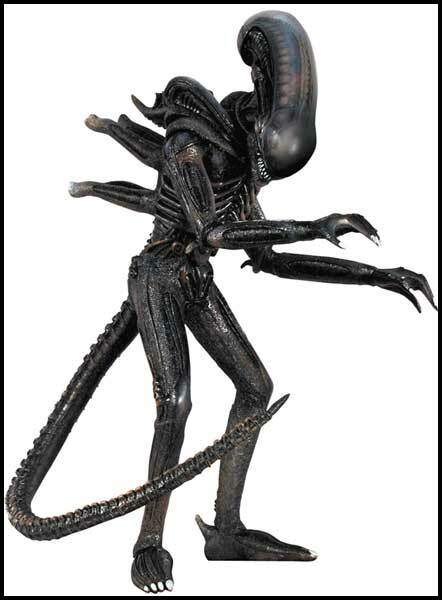 I particularly like the design of the alien weapons and spacecraft, which forego many of the existing "standbys" of alien design, such as just ripping off Close Encounters, The X-Files, or HR Giger.......Geiger?.......Gyger? I will say that the actual enemies could have used work, such as the Covenants with the shields. They just look like dinosaurs. On the whole, though, its a win. The game does falter a little bit here. At this point I'm far enough into it that I've seen the "headcrab" aliens, and I've now discovered that the world is going to end (in addition to the war going on) and I've got to stop it. A cliche, but a dependable one. What's upset me up to this point is that Master Chief and the rest of the cast are boring. At first I thought he was supposed to be silent but, no, he talks. He talks enough that he's not a Gordon Freeman or Crono. He's a Sam Fisher or Max Payne. Honestly, the most interesting thing about this character is probably his power armor, and even Iron Man can't say that. Cortana is actually a little more affective than he is, and she's not even real ... Yes, its a game so nothings real, but I mean shes not human. 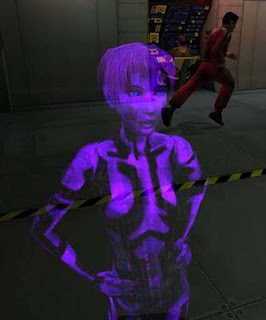 She's the AI for the computer on the humans' battleship.After being attacked, she is uploaded to Master Chief's suit for safekeeping, functioning as a "Daxter" for most of the game, but with navigation and door-opening functions. Most of the dialog comes from her talking to you from inside, saying things like "We've got to get to the top of that cliff if we want to move on" and such. Live I've said before, characters are very important for getting the player "into" it, and having a companion character like this works in this case. Most of the other marines in the game are on the cookie-cutter side, spouting a bunch of soldier jargon and trading off macho insults and "Go, go go!"s. Not bad, just meh. I really liked the design of the aliens' architecture, and how it's actually pretty unique. The inside of space ships, for example, have white textured floors with neon green and magenta walls with some foil effects. It's not revolutionary or anything, but at least it's not that "grimey gunmetal" style of alien craft, or the Apple i-spaceship look. This design extends into the alien weapons and said uniqueness also applies to the marines' weapons. I was actually surprised that they were able to make modifications or in some cases improvements where gunplay mechanics are concerned. Alien weapons, for instance, do not have to be reloaded. They have a single ammo supply which, when depleted, necessitates throwing the whole gun away. Instead of reloading, you need to only watch the gun's what-i'm-guessing-is-heat gauge and make sure you don't fire too much at once. 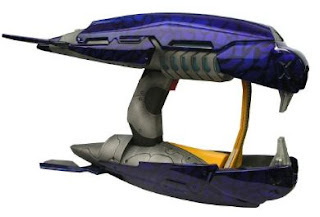 The shape of the weapons is like nothing I've seen before and most weapons have a spiffy visual indicator for ammo (as well as the standard counter in the HUD), such as a pulse rifle-style counter on the assault rifle, a "thermometer" on the side of a pulse rifle or descending spikes on the needler. The only real problem I had with the weaponry was the fact that, except for the big'uns, there never really seemed to be a "best" weapon for any job. My guess is that to keep it's focused-on multiplayer fair, they had to make sure most weapons fared well in any situation. It makes it so that there's never really a bad weapon to use, but there's never any particularly useful one. So there's part 1. Based on how the game "feels", I'd say I'm halfway through and I'm interested enough to want to finish. My initial prejudices against the game have proven largely unfair, though I still stand by my feeling that the game does not deserve the massive amount of hype it has. Then again, no game really deserves the amount of hype it has. If any of my favorite games had had this amount of hype and the stereotype of what kind of fan it has, I never would have looked them up. Let this be a lesson (mainly to me) that fans, hype and pretense almost always misrepresent a game. Putting the time into something and finding out for yourself is really the best way to go in any situation.